2Department of Electrical and Computer Engineering, University of Tabriz, Tabriz, Iran. As regards the number of electric vehicles and their batteries energies vary in charging or discharging modes, the vehicle to grid technology can act as a variable load in charging mode or as a variable energy source in discharging mode. In this paper, a new approach is proposed. In the proposed approach, the control of the connection node voltage and the coordination of the charging and discharging of the EVs batteries are considered as the variable objective functions. The constraints are determined by several parameters such as the state of charge, connection node voltage, and charging-discharging time. 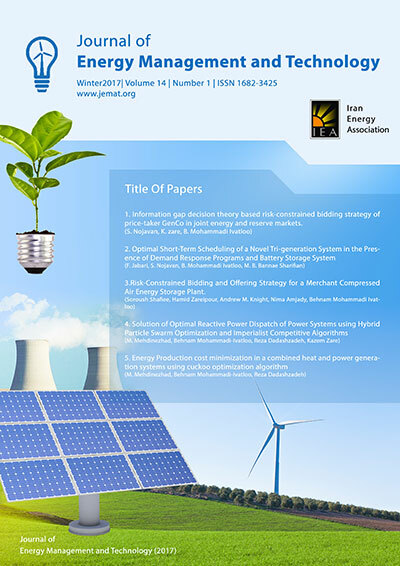 Based on the proposed approach, the decision variables, which are the active and reactive powers exchanged between the EVs aggregator and the grid, are determined to achieve the defined objective functions. Reduction of grid losses in the peak load hours is the other advantage of the proposed approach. The simulations for a typical distribution system with V2G capabilities, based on the proposed approach, are carried out and tested for the different scenarios in charging and discharging modes. Finally, to lend credence to the proposed method, its results are compared with the results of the conventional method.